﻿ BRAVE STORY « Haikasoru: Space Opera. Dark Fantasy. Hard Science. Alone after his father his hospitalized and his mother attempts suicide, Wataru Mitani ventures from the real world to the land of Vision, where he seeks five magical gemstones representing the qualities of charity, bravery, faith, grace, and the power of light and darkness. With these, perhaps Watari can change his fate and bring his family together again. Why, just in time for holiday shopping! Miyuki Miyabe's first novel was published in 1987, and since that time she has become one of Japan's most popular and best-selling authors. 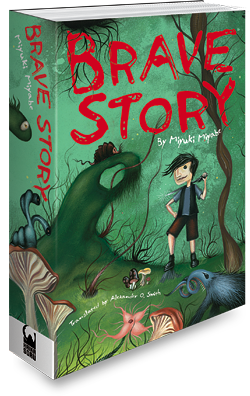 Miyabe's 2007 novel Brave Story won The Batchelder Award for best children's book in translation from the American Library Association. The Book of Heroes is her sixth novel to be translated into English. Suddenly, the flashlight in Kenji’s hand went out. Kenji staggered back, his shadow wavering on the tarp behind him. His shadow. Even though the flashlight had gone out, it was strangely bright inside the tarps. He could see everyone’s faces even more clearly than before. Mitsuru’s voice continued in a rhythmic chant. The words were clear, crystalline. “To those who oppose me grant the eternal sleep of death, and in ice unmelting bind them. Sacuroz, helgis, metos, helgitos! Come, Balbylone, Daughter of Darkness!” he was saying. The words were like a spell, and when he was finished, Wataru realized why it was so bright. The ground surrounded by the boys was shining white, casting a pale glow on the space inside the haunted building. The glowing area was a circle, a little smaller than a manhole. As he watched, it seemed to rise, swelling. It was almost like something was being born from the ground. The otherwise firm-packed dirt looked, in that one shining circle, to be as malleable as clay. And there he saw a head–a person’s head–emerging. First the top of the head, and the neck, then shoulders, and the chest with two arms folded across it. It was a slender body, lined in graceful curves.